BLOOMFIELD, N.J. — A small, unassuming painting, one of a grouping of decent paintings from an estate in Essex County is believed to be a long lost and early painting by Rembrandt, one of five allegorical works he painted on the five senses. 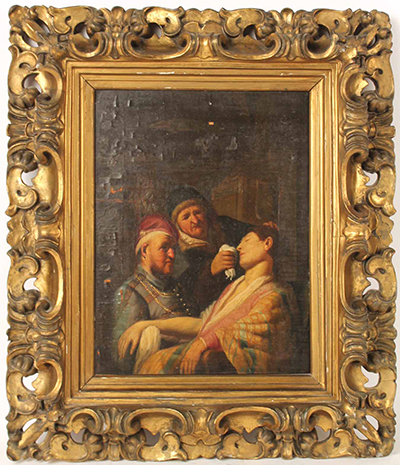 Estimated at $500-800, the oil on board depicting a fainting lady hammered at $870,000 ($1.1 million, including the 25 percent buyer’s premium) to a European phone bidder Tuesday, September 22, at Nye & Company’s auction. 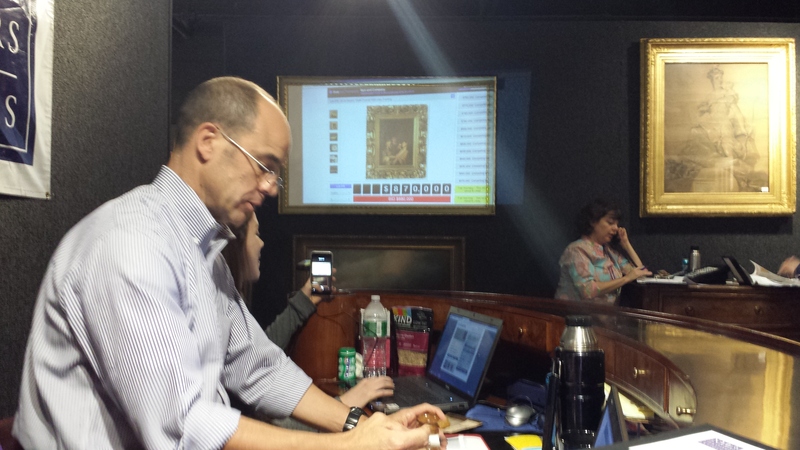 Auctioneer John Nye was still reeling a day later about the turn of events. The 12½-by-10-inch work, cataloged as Continental School and appearing unsigned, was truly the sleeper of the sale. As John was a tad busy calling the auction, he didn’t get to speak to the underbidder, a British dealer, but the dealer told Nye’s colleagues “some tasty morsels” and what made this painting clearly a Rembrandt and that it closely resembles other works in Rembrandt’s allegory series. “When you compare it to the other figures (in the series) it’s pretty clear that this is the “Sense of Smell,” he said. “The painting came to us in the most benign way, which makes the whole thing that extraordinary,” he said. It was part of an estate where the children had inherited things from their parents and as it was close by, John went out on a house call to view the items. “I get these calls all the time,” and at this one, the family had laid out silver on tables, there were some furniture items and stacked up in one corner, there were some paintings that looked good but gave no indication as harboring something truly special. Auctioneer John Nye notes the hammer price of $870,000 in his record book just after whirlwind round of bidding ended. And during the two week-long preview at the gallery leading up to the sale, there were no indications that the painting, lot 216, was a rare Old Master. Auctioneers will usually get a sense of which lots will do well, based on how many condition reports and requests for additional images or photographs a particular lot will get during preview but not this time. “Mum was the word on this painting,” John said, and it stayed like that until the lot crossed the block. Bidding opened up at unremarkable $250 and proceeded in the usual increments until $10,000. “It started to get exciting when we got up to the six figures. When the underbidder got to $200,000, the competition went to $210,000 and the underbidder jumped it to $300,000,” John said. The underbidder did the same again at $310,000, jumping it to $400,000 but his intimidation tactics didn’t deter the winning bidder, only described as a European phone bidder, who hung on until the end. The final sale result was especially sweet to Nye as this is first time breaking the “elusive million dollar sale.” Quite fitting it came from a painting that proved to be equally elusive.